Embryo cryopreservation, or embryo freezing, is often utilized during IVF cycles as a way to preserve “leftover” embryos created during a fresh IVF cycle for use in future frozen IVF cycles. Embryo freezing is also an effective method of fertility preservation. The main difference between embryo freezing and egg freezing is the presence of sperm. In embryo freezing, eggs are retrieved and then fertilized by sperm to create embryos, and the embryos are analyzed using preimplantation testing (PGT), then cryopreserved until ready to be used to attempt pregnancy. Embryo freezing may be a good option for couples who want to delay parenthood, as well as single women and lesbian couples who have chosen a sperm donor, but do not want to get pregnant right away. Recently, there has been a movement towards electively freezing embryos and then transferring them in a subsequent cycle. This technique appears to improve implantation rates in some patients. Additionally, freezing embryos will allow for an embryo to be biopsied and the DNA analyzed so that only the healthiest embryos can be subsequently transferred. Embryo cryopreservation represents the latest in cutting-edge technology for couples that are looking for the most effective, most successful ways to delay childbearing and preserve fertility. The reasons for this choice are varied, and can range from the pressures of furthering career or education to decisions being driven by medical challenges. Recent advances in embryo preservation have meant that over 90 percent of embryos that have gone through the process have been successfully frozen and thawed, with many being successfully implanted and resulting in healthy pregnancies. Where in the past, the decision to delay getting pregnant has created the very real risk of future problems in conceiving, embryo cryopreservation eliminates those concerns. 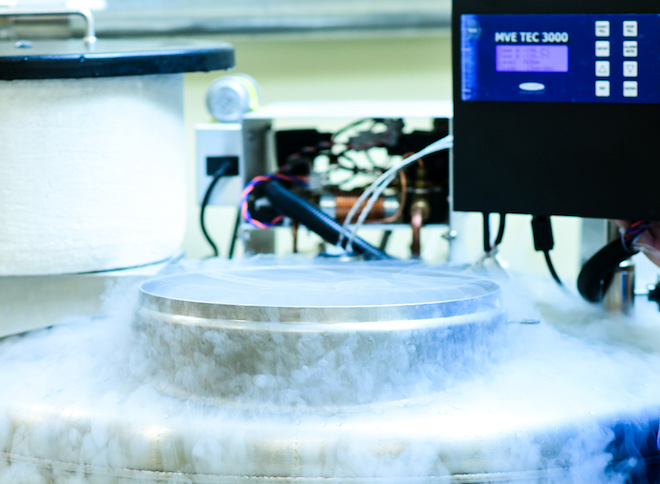 The technique utilizes a fast freeze method known as vitrification that allows embryos and eggs to be preserved indefinitely for future use. This means that women no longer need to fear the impact that aging may have on their ability to have healthy babies, as eggs for embryo cryopreservation can be retrieved early in her reproductive life and preserved for future use. Additionally, those embryos created as part of an IVF treatment can be saved for use for a future pregnancy, greatly reducing the risk of secondary infertility. In addition to providing women and couples with the freedom to become pregnant at the time that is best for them, embryo freezing offers the advantages of Preimplantation Genetic Screening, a process in which a five-day-old embryo is biopsied before being cryopreserved to determine whether any chromosomal abnormalities are present. The healthier the embryo, the higher the likelihood that a healthy pregnancy and child will be the end result.